I've search the forum and concluded that for my street driven 393 stroker 351C the best plugs are probably Autolite 25 or Champion RV15YC gapped at .055. I have an MSD distributor and 6AL module. Do I have the right conclusion. What about platinum or other plugs. factory cast iron heads with tapered spark plug seats? .055" is more gap than the suggested plugs are designed for, by a lot. the ground strap will not be parallel to the center electrode causing rapid wear and short plug life. the gap will not hold at .055" for long at all, but will increase as the electrodes wear. but be careful these are extended projection tip plugs and may reach the piston? 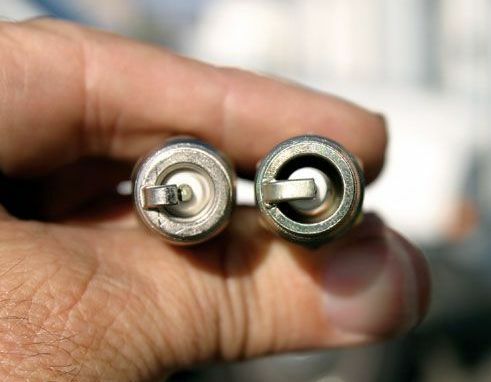 ...The Experts with Thousands of Pages of Dyno Results and Research, have Documented..."There is NO evidence of Any Power Increases with Any Spark Plug Gap Larger than .050"." I have found that to be true, So I Gap My Plugs to .045". So as they 'Wear-In', they Come Into Tolerance , rather than Out of Tolerance. I have tried/experimented with the Champian Plugs in the 351C. They worked well in My 400 Pontiac, But NOT so great in the Cleveland. Goldy-Locks, 24=Too Cold. 26=Too HOT and with Increased Pinging! 25=Just Right! So Now You've Heard it From 'The Horses' Mouth'! NO BS, NO Theory, just Years of Road Tests. The Autolite Racing plug, on the left, has several nice features. Platinum plugs do not work well.